2015 marks the 10th anniversary of the leadership externship that has taken more than 200 USC Chan students to Africa’s West Coast. 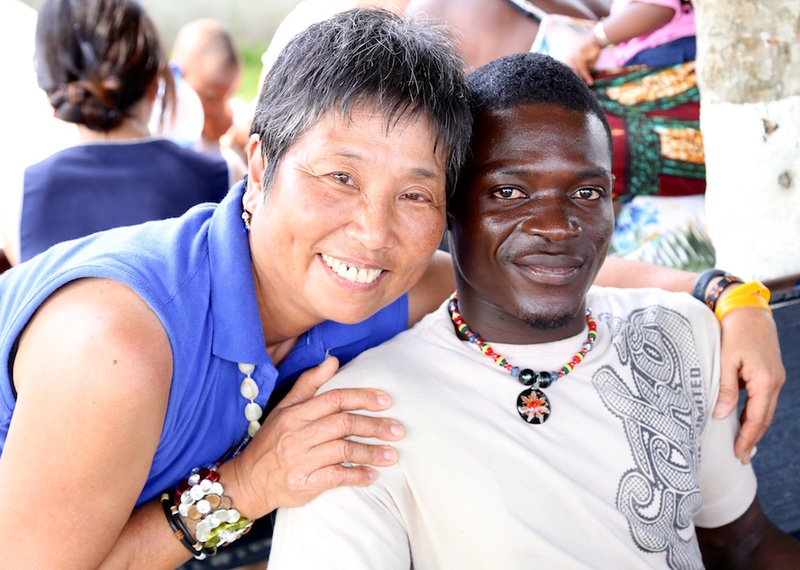 Only two years later — thanks to her passion for OT and a good deal on airfare — Nakasuji returned to Ghana with 10 USC Chan students in tow to help adults and children with disabilities. During the past decade, Nakasuji, an adjunct associate professor at USC Chan who coordinates the division’s leadership externship to Ghana, has ushered 232 USC OT students to Ghana, taking on some 50 duties from arranging air travel to lecturing at universities. Traditionally, Ghanaian society has held an attitude that those with disabilities are “useless,” Nakasuji says. It’s even more pronounced in small villages. According to traditional Ghanaian religious thought, people with disabilities are “cursed” as a result of the family’s sinful behavior. To avoid the stigma, families often abandon their disabled children. Enter Mephibosheth Training Center. This boarding school for children with special needs opened its doors in March 2005 to take in these “throw-away” children — ages 4 to 22 — and educate them to contribute to society in meaningful ways. 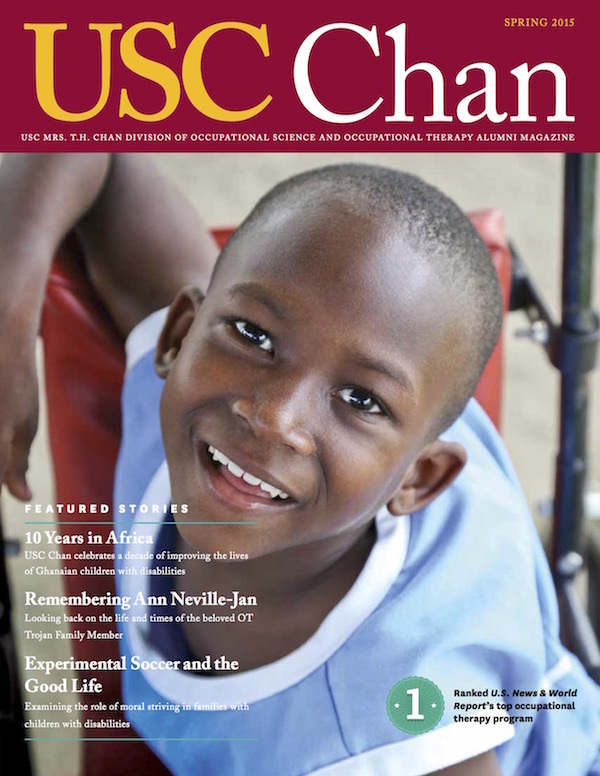 Since USC Chan began working with Mephibosheth a decade ago, 232 occupational therapy students have had service-learning experiences at the special needs school. “Some people in Ghana think people with disabilities can’t do anything, so they’re not only cursed, [they’re] worthless,” Nakasuji explains. Many Ghanaian children have a story of survival, Nakasuji says, including a boy she met who remembers his father taking him to the bush and leaving him to die. “The country has really changed in the last few years, with more locally run and locally funded programs,” says Mariko Yamazaki MA ’10, OTD ’11, who first went to Ghana as a student and now co-coordinates USC’s leadership externship. Eight years ago, the University of Winneba in central Ghana launched a community-based rehabilitation (CBR) program to empower those with disabilities. As part of their externship, USC OT students are paired with CBR students for a leadership activity. 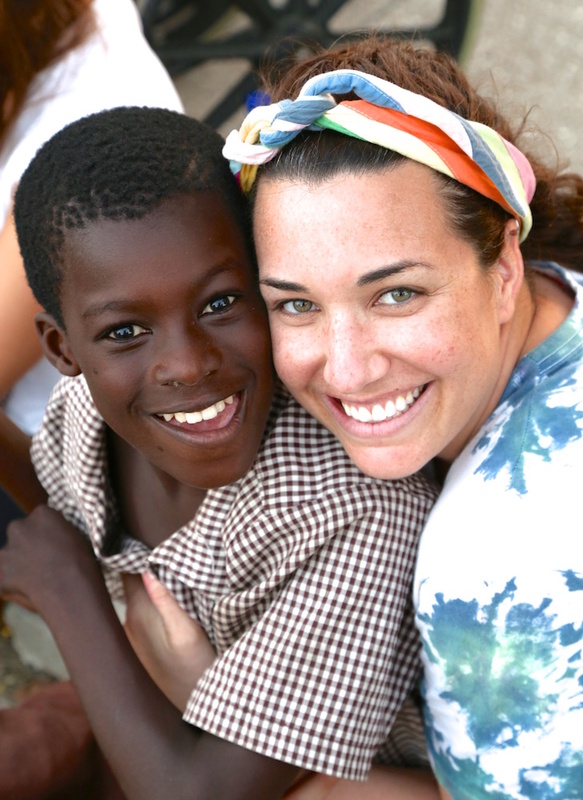 OT students join CBR students at a hospital, village or school, and together they work providing support and advocacy for patients, often with little or no money or equipment. The most common disabilities OT students encounter in Ghana are cerebral palsy and polio, Nakasuji says. “Many people don’t have access to the polio vaccine or refuse to vaccinate because they believe it causes impotence in boys,” she explains. USC OT students have also worked with children with a range of disabilities at the Mephibosheth Training Center since the day it opened in 2005. 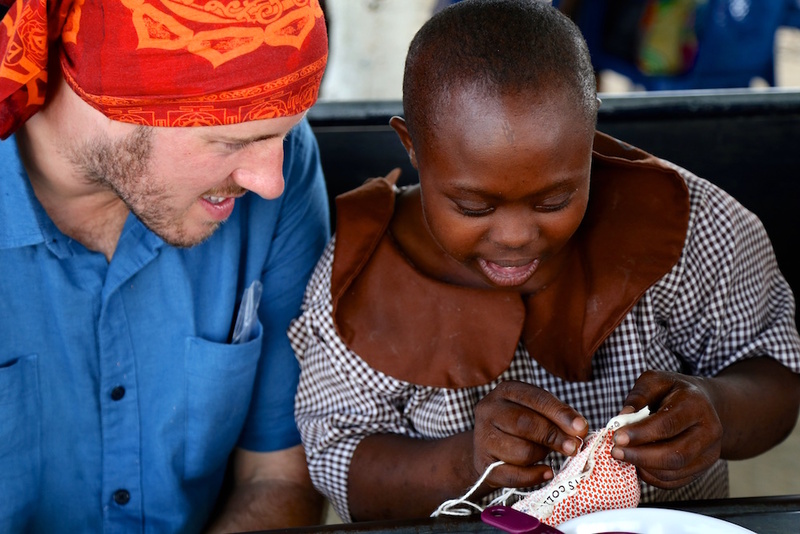 OT students present simple, fun activities related to sewing, leatherwork or woodworking and offer feedback on the child’s capabilities and strengths, as well as strategies to help the child perform the job or a specific task. With the launch of the country’s first OT program in 2013 at the University of Ghana, USC students took on another role serving as mentors to incoming Ghanaian students. Since OT is so tied to culture, Nakasuji and Yamazaki wanted to assist Ghanaian students without imposing an American perspective on OT. “They don’t have any [Ghanaian] OTs yet, since the first class from the university hasn’t graduated yet, so I don’t know what OT will look like in Ghana,” Nakasuji says. Year after year, USC students tell Nakasuji how their experience in Ghana has profoundly impacted how they practice OT. “Cultural competency implies something static. It makes us feels we’re accomplished when we never will be,” she says, referring to the ways in which cultures change over time. Nakasuji teaches students to bask in the cultural differences of Ghana, and to apply that same openness when working with a client at home. While a clinician and patient might share experiences—the same hometown, ethnicity and religion — Nakasuji says an OT can never fully understand the client’s experience, culture or context.